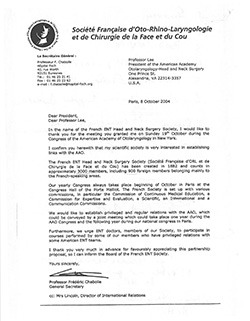 Click image to see the 2004 letter to the AAO-HNS from KJ Lee, MD, Coordinator for International Affairs for Société Française d’ORL et de Chirurgie de la Face et du Cou. The exchange of ideas at international meetings and at the AAO-HNSF’s Annual Meeting & OTO Experience provides an excellent platform for discussion and the sharing of knowledge, covering a broad range of clinical information and other issues of mutual interest. 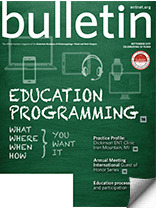 Each year, Academy/Foundation leadership recognizes a select number of countries that work to significantly advance the specialty on a global scale, by designating those countries as International Guests of Honor at the Academy’s Annual Meeting. The Academy is pleased to welcome and honor the Republic of France and the Société Française d’ORL et de Chirurgie de la Face et du Cou (the French ENT Head and Neck Surgery Society) leadership, members, colleagues, and friends from the country to the 2017 Annual Meeting & OTO Experience. The Société was formally affiliated with the AAO-HNSF in the International Corresponding Societies (ICS) network during the tenure of KJ Lee, MD, Coordinator for International Affairs in 2004. Professor Frédéric Chabolle, then General Secretary, Société Française d’ORL et de Chirurgie de la Face et du Cou, expressed interest in establishing links with the AAO-HNS in a letter to Dr. Lee, which is available online. French ENT Society Leadership, from left to right, Dominique Chevalier, Bernard Fraysse, Jean Marc Juvanon, Emmanuel Babin, and Frederic Chabolle. Excerpt by Professor Francois Legent, former president of the French Society of ORL-1997, University of Nantes.